Norcent Technology, Inc. will introduce a new feature-rich addition to its digital camera product offering at CES. Just over an inch thick and weighing only 4.9 ounces, the Norcent DC 820 is a compact, lightweight, 8.0 Megapixel digital camera that is filled with a wealth of features. Its exceptionally large, scratch-resistant 2.4-inch color LCD display provides enhanced still image and video viewing, and its 3x optical zoom and 4x digital zoom helps zero in on subject matter without sacrificing quality. The Norcent DC820 captures crisp, clear digital images at resolutions of up to 3264 x 2448 pixels. 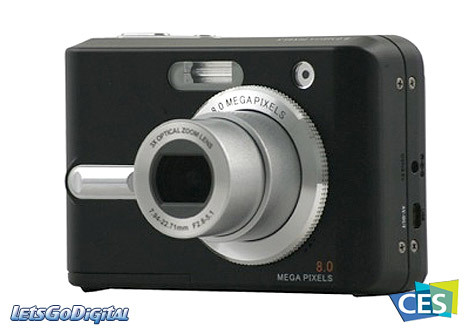 This Norcent DC-820 digital camera is truly an outstanding consumer value with an estimated street price of $299.99. Norcent DC820 - 8 Megapixels - "Value-conscious consumers no longer have to settle for limited features and low quality photos," said Jennifer Long, CEO of Norcent. "The Norcent DC-820 provides an amazing array of options, like an extra-large LCD display, both optical and digital zoom and a high resolution, 8.0 Megapixels. The camera is so compact users can take it along to save and share snapshots or video memories anywhere. The Norcent DC-820 also supports PictBridge which allows the direct connection and printing of photographs from PictBridge certified printers. Norcent DC-820 digital camera - Flash and Exposure - The Norcent DC-820 digital camera offers many flexible flash options, including auto, forced or no flash and red eye reduction; the camera also features a wide range of lighting and scene settings. Whether you're on the beach or on the slopes, indoors or outside in the middle of the night, Norcent cameras will provide the right amount of exposure and brightness for clean image detail every time. Norcent DC 820 camera - Price and Availability - In movie mode, the DC820 can captures video clips at 640 x 480 resolution and playback in either NTSC or PAL formats. Other features include a double self-timer and support for multiple languages. The Norcent DC-820 has 32MB of internal flash memory, and is compatible with high-capacity external storage media (SD and MMC memory cards). The Norcent DC 820 arrives with USB and AV cables for connection to a computer or TV set. 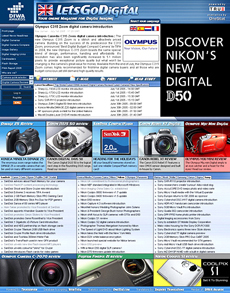 Norcent's DC-820 digital camera will be available at retailers nationwide beginning in January 2006, with estimated Street Prices of $299.99.